OKLAHOMA CITY--(BUSINESS WIRE)--SONIC® Drive-In proves once again that hot desserts with cold ice cream is a match made in heaven with the all-new OREO® A La Mode and Cinnabon® Cinnasnacks® A La Mode. Once only available at the annual state fair, fans can now enjoy piping hot fried OREO cookies served with a side of SONIC’s Real Ice Cream. And that’s not all – even SONIC’s beloved Cinnabon Cinnasnacks can now be enjoyed paired with Real Ice Cream for a delightful snacking experience. 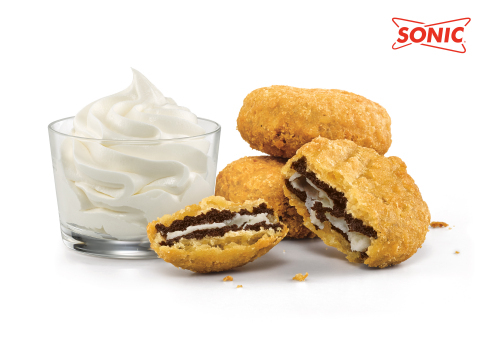 The OREO A La Mode is made with AMERICA’S FAVORITE COOKIE®, perfectly battered and fried to create a delectably crunchy and dippable treat served with SONIC’s famous Real Ice Cream. The Cinnabon Cinnasnacks A La Mode features warm, flakey pastries filled with melt-in-your-mouth cinnamon roll filling served with SONIC’s Real Ice Cream. Available for a limited time, both the OREO A La Mode and the Cinnabon Cinnasnacks A La Mode can be enjoyed at a local SONIC Drive-In for just $2.99*. With the SONIC app, guests are First in Line Every Time and SONIC drinks and Slushes are half-price any time guests Order Ahead**. The SONIC app is free to download, and available in the Apple App Store and Google Play Store. **See app for details. For a limited time only at participating SONIC® Drive-Ins. SONIC, America's Drive-In is the nation's largest drive-in restaurant chain serving approximately 3 million customers every day. Ninety-five percent of SONIC’s more than 3,600 drive-ins are owned by local business men and women. For 65 years, SONIC has delighted guests with signature menu items, 1.3 million drink combinations and friendly service by iconic Carhops. Since the 2009 launch of SONIC's Limeades for Learning philanthropic campaign in partnership with DonorsChoose.org, SONIC has donated $11.7 million to public school teachers nationwide to fund essential learning materials and innovative teaching resources to inspire creativity and learning in their students. To learn more about Sonic Corp., please visit sonicdrivein.com and please visit or follow us on Facebook, Twitter and Instagram. To learn more about SONIC's Limeades for Learning, please visit LimeadesforLearning.com. 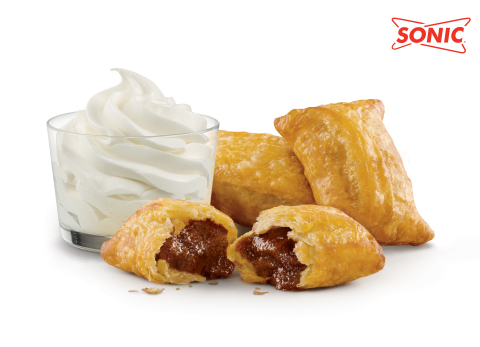 SONIC adds new OREO® A La Mode and Cinnabon® Cinnasnacks® A La Mode to its all-day menu.